I am an integrative evolutionary biologist who combines physiology, genetics, and transcriptomics to understand the evolution of functional, phenotypic and genetic variation in a broad geographic and temporal context. Most of my research is with reptiles and amphibians, but I have also worked with invertebrates. Lauren is interested in ecology, evolution, and conservation biology. She joins the lab from Maryville College, where sthe studied sea turtle conservation in Costa Rica. In our lab, she will be studying the ecology of coral snake mimicry in Central America. Adam is interested in physiology, ecology, evolution, and genomics. He joins the lab from the University of California-Merced, where he studied the ecology and evolution of lizards on Greek Islands. 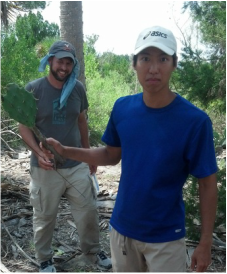 In our lab, he will be studying the role of phenotypic plasticity and gene expression in adaptation to a changing climate. Scott is interested in ecology and conservation genetics. 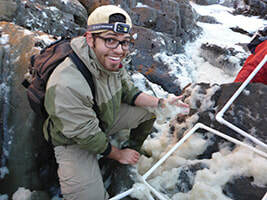 He joins the lab from the Ohio University, where he studied the feeding ecology of invasive crayfishes. Along with Jamie Roberts and the Coastal Plain Fisheries lab, he will be studying the conservation genetics of imperiled unionid mussels. Ryann is a biology student at Georgia Southern University. Her research is on the evolution of decoy coloration in lizards. Kimberley is a biology student at Georgia Southern University. She is working on the Pond Recovery Project at Georgia Southern, which is funded by the Center for Sustainability from the Student Sustainability Fee. Student Sustainability Fees at Work! Tacarie is a biology student at Georgia Southern University. He is working on the Pond Recovery Project at Georgia Southern, which is funded by the Center for Sustainability from the Student Sustainability Fee. Student Sustainability Fees at Work! Al-Amin is a biology student at Georgia Southern University. He is working on the image analysis for the coral snake mimicry project in Honduras. ​John David Curlis is interested in the evolution and physiology of reptiles and amphibians. He joined the lab in 2015 from the University of Virginia, where he studied physiology, performance and behavior of anoles (Anolis sagrei, A. limifrons and A. humilis) and spiny iguanas (Ctenosaura similis) in the laboratory and in the field in Florida and Costa Rica. His thesis work focused on the evolution of mimetic and non-mimetic traits is the highly polymorphic ground snake. John David graduated in December 2017 with his Master's degree, and is in graduate school for a PhD at the University of Michigan with Alison Davis Rabosky! Albert is interested in ecology, evolutionary biology and physiology. 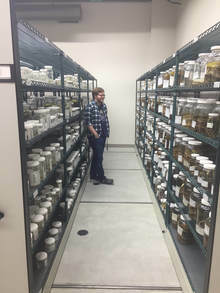 He joined the lab from the University of Virginia, where he studied immune function and parasitism in brown anoles (Anolis sagrei) in the field. His thesis work focused on the sexual divergence in phenotype and gene expression of brown anoles during development. Albert graduated in December of 2018, and will be working on a PhD. in Shane Campbell-Staton's lab at the University of California Los Angeles! Jessica Bowers studied spatial and temporal heterogeneity of color pattern in the polymorphic cricket frog in natural populations in southern Georgia. She graduated with her bachelor's in 2017, and started on her Master's at Georgia Southern University, studying cuttlefish behavior and neurobiology! Chinonye Obialo studied the spatial and temporal heterogeneity of color pattern for cricket frogs in the Georgia Southern Herpetology Collection. Chinonye graduated in 2016, and is pursuing a career in the health field. Hilariann studied the thermal sensitivity of performance in the centipede Scolopocryptops sexspinosus. In fact, she developed the assays that current students are using to study these critters! Hilariann graduated from Georgia Southern in 2016, and is pursuing a career in biomedical sciences. Zach is broadly interested in ecology and evolutionary biology. His projects in the laboratory have focused on studying the function and evolution of antipredator coloration in squamates. Shane is interested in natural resources management. While in the lab, he has continued centipede research, focusing on their thermal physiology. Kyle is a biology student at Georgia Southern University. He has been studying the evolution of dewlap size and color in anole lizards. Quinton is broadly interested in ecology, evolutionary biology, and conservation. His project in the laboratory has focused on studying size-dependent predation in rough earth snakes.